I know I don't post much on the main board, but I still visit all the time! 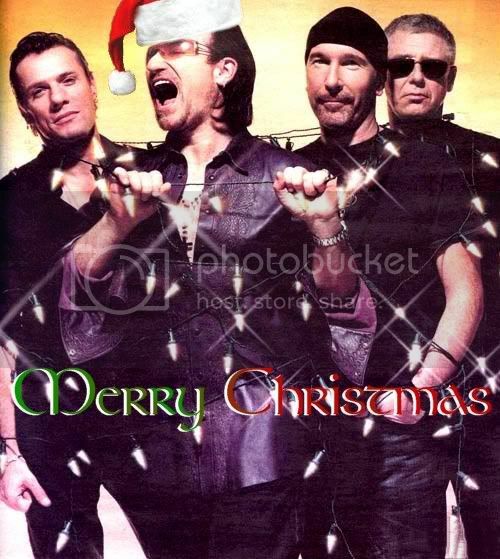 Have a wonderful, U2 filled holiday! Thanks, and same to you Awesome pics! Thanks U2 Granny. What a great gift. Have a great Christmas Day everyone. You are lovely, you don't deserve to be sad. Merry Christmas everyone! Have a safe and happy Christmas, especially you Jamila! Merry Christmas to everyone! And to you Jamila. I hope you feel better soon. thank you, PLEBA, for your good thoughts and wishes. My recovery from surgery is having some complications - nothing life-threatening, but distressing. I do enjoy looking at all these wonderful pics - they make me smile. Jamila, I hope my thoughts and prayers for you to feel better soon will reach you as soon as possible. thanks for spreading the U2 Love, Lady Luck.